A strong base: it should be fresh, crisp, organic, and nutrient-dense. If you're eating a salad, make it worth it! The darker the greens, the better! In this version I opted for kale and cabbage. I love the crispiness they offer and the color combination of them together is incredible. It's colorful: speaking of color, every color we eat gives us different vitamins and minerals, in addition to making the salad visually more appealing. We eat with every sense, and the more we consider this when we create, the more we will get out of our foods. See how many colors you can squeeze onto your plate! Includes a protein: while we do get protein from vegetables, I love to add extra with a whole grain or beans. In this version I chose to include farro, one of my favorites that I always have on hand. Has a great dressing: a great dressing is delicious, good for you, and made for the salad in mind. Dressing doesn't need to be full of sugar, and one size does not fit all! I find that making my own dressings is cheaper, I know what is going into it, and I don't end up with 15 half-used dressing bottles in my refrigerator. The following salad is a version of a "Greens and Grains" salad that I make quite a bit. My base is almost always kale and farro. From there, the "switch up" is based on what I have on hand, what I'm craving, and what colors I have in my kitchen. This one really hit the spot! The dressing is one what I whipped together a few years ago with leftover cilantro, and one that I never really cannot get enough of. Keep in mind that the best thing about salad is that there are no rules! These are guidelines. Feel free to add more or less of an ingredient or add your favorites that aren't listed here to make it a bowl of goodness that you truly love and can't wait to dig into. 1. If your farro needs to cook, start with that! Farro cooks like pasta, so grab a medium-sized saucepan, warm it over medium-high heat, add water and a bit of salt. Make sure you rinse your farro well, add it to the saucepan, and bring it to a boil. Cook until al dente, anywhere from 15-25 minutes. Drain, rinse, and set aside. 2. Next, cook the chopped sweet potato. Warm coconut oil in a skillet over medium heat, add sweet potatoes and cook, stirring occasionally, for roughly 10 minutes or until tender. 3. Prepare your dressing: simply add all dressing ingredients to a blender and blend to smooth or add ingredients to a bowl and blend with an immersion blender. Season with sea or pink salt and pepper to taste. 3. 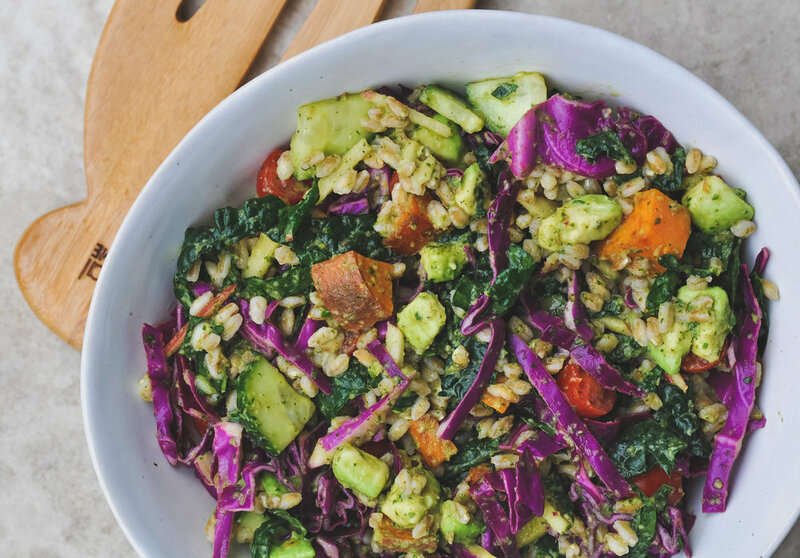 Add all prepared salad ingredients to a big bowl (or prepare them while your farro continues to cook): kale, cabbage, cucumber, tomatoes, apple, and avocado. Toss to combine. 4. Add farro, sweet potatoes, and dressing to big bowl, toss to combine, and serve!